Most experts seem to agree that if the world has not already reached peak petroleum production, then it will do so within the next 20 years. Elsewhere on the site it is explained that peak oil does not mean that petroleum reserves have run out, but that the maximum rate of petroleum extraction has been reached and that subsequent methods of extraction cannot increase the rate further. Over time, the total rate of petroleum output will decrease. This naturally leads people to question what the future will look like. Several scenarios are possible and it seems that all of them will come true to some degree or another, rather than any single one of them coming true alone. Efforts have already been made to extract oil that was once considered uneconomical to produce. 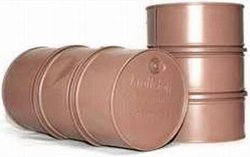 As the world supplies of light, easily extractable crude oil continue to decrease and demand continues to increase, the price people are willing to pay for a barrel of crude will increase as well. As a result, heavier oil that was once uneconomical to extract due to high upfront costs has become profitable to produce. Countries like Canada and Venezuela and United States all sit atop extremely large deposits of heavy oil and oil shale. In fact, it is estimated that there is more heavy oil in Venezuela then there is petroleum in the entirety of the Middle East. Canada is currently the world’s leading producer of heavy oil and it is estimated that the heavy crude in Canada is enough to supply the entire world at current demand for well over 200 years. Of course, the vastness of the supply is only one of the considerations of extracting heavy oil. Production methods for heavy oil are discussed elsewhere, but the two things they have in common are decreased energy returned on energy invested and it increased impact on the environment. While world demand for petroleum continues to rise, there has recently been competing interests from environmental lobbies concerned about the long-term impact of extracting heavy crude. Environmental concerns arise not just from the direct impact of the environments, but also from the fact that the decreased energy returned on energy invested for heavy oils means that they produce more greenhouse gases and other pollutants than do same quantities of lighter crudes. In other words, the extraction and use of heavy oil is expected to exacerbate the problem of carbon dioxide and greenhouse gas emissions throughout the world. What is clear is that heavy oil production will be necessary in the near future unless there is a drastic decrease in demand for petroleum. While techniques are being developed to help reduce the impact of extracting heavy oil on the environment, there is little doubt that utilization of this resource will have substantial negative impact. For this reason, conservation has become more important than ever. The less oil the world uses, then the less the environment is impacted both from current and future oil production activities. Conservation efforts are less about concern over running out of oil than they are about concern of increasing use of oil. Environmentalists point out that time and money being spent on research and development for the extraction of heavy oil could be better invested into developing alternative energies. Because the transportation industry is responsible for using 70% of all crude oil produced, there has been great effort in the last two decades to produce an electric vehicle capable of performance similar to that of petroleum powered vehicles. While there are major obstacles to overcome, recent advances have seen mileage ranges increased from less than 100 to well over 200 miles. The major factors holding back the mainstream production of electric vehicles are the cost of batteries, the production and recycling of batteries, and the time that it takes to charge a battery. In other words, the only thing holding back electric vehicles is how they store electricity when the vehicle is not in use. A cheap, efficient, reliable alternative to current batteries would make electric vehicles instantly practical. Many proponents of electric powered vehicles point to hybrid vehicles as the logical bridge between petroleum vehicles and vehicles that rely 100% upon electricity. Hybrid vehicles offer the benefits of unlimited mileage obtained from gasoline while increasing fuel economy through the employment of electric motors as well. These hybrid vehicles are slowly but surely progressing from a disproportionate amount of reliance on petroleum to increased reliance on electricity through techniques like adding solar panels, regenerative braking, and plug-in capabilities (allowing them to be charged through the electrical grid rather than by running their petrol motors). It is worth pointing out that while electric vehicles can reduce petroleum use, the source of electricity used to charge their batteries is of critical importance. If that energy does not come from clean, renewable resources, then the problem is simply being shifted from one location to another and is not being solved. Proponents are clear that the success of electric vehicles also depends upon the implementation of renewable resources for the generation of the majority of electricity. Technologies like solar, wind, hydro, and geothermal are all being investigated and have met with various levels of success throughout different regions of the world. What is clear about petroleum is that it will continue to play a large role in our lives in the near to medium term future. While technologies are being invented to reduce our dependence on fossil fuels, it will be several decades before they become commonplace and affordable. Some of the major car manufacturers across the world estimate that it will be at least 2025 before electric vehicles are competitive in terms of cost and performance with petroleum powered vehicles. Even if the world switched to an energy source independent of petroleum, one must not forget the fact that petroleum is an integral part of modern life in terms of the things it is used to make beyond gasoline and other fuels. Objects as diverse as plastics, pharmaceuticals, and cosmetics use various aspects of petroleum as foundations in chemical reactions. In fact, our tremendous reliance on petroleum for manufacturing and not for fuel is all the more reason to be conservative about simply burning it to drive across town.